There are a great number of boating magazine’s that go into details on trawlers. PassageMaker, Yachting, Sea, Pacific Yachting, Ocean Navigator, Soundings, Power and Motoryacht, Power Cruising, etc. Pick up an issue of each, pour through the contents and get a feel for that magazines style and then subscribe to those publications which speak to your interests. As you delve deeper you will determine through articles and advertisements which “brand” you find the most appealing and appropriate for your intended cruising plans. The internet is a great way to find out more boat specific trawler details. The two largest MLS (multiple listing services) internet directories are YachtWorld and YATCO. Here you can research the price, location, specifications, model year, etc. of just about every brand of trawler. You can compare like models and also learn the differences between brands. As you start to narrow your search to the right size and brand(s) you can “Google” these specific models to find out even more details. How do you physically fit in the living and working spaces? Is there enough headroom and are the hallways easy to walk through? Can you see out the pilothouse windows? What about seating in the saloon, is it comfortable and can you look outside? Are the stateroom beds big enough and comfortable for getting a good night’s sleep? Can you easily sit down on the head and are the showers big enough? Do you have enough room to move about in the working spaces – engine room and lazarette – for normal inspections and service of equipment? Do you like the fit and finish, is the quality level appropriate with the price you will pay? Seeing trawlers out of the water is very revealing. 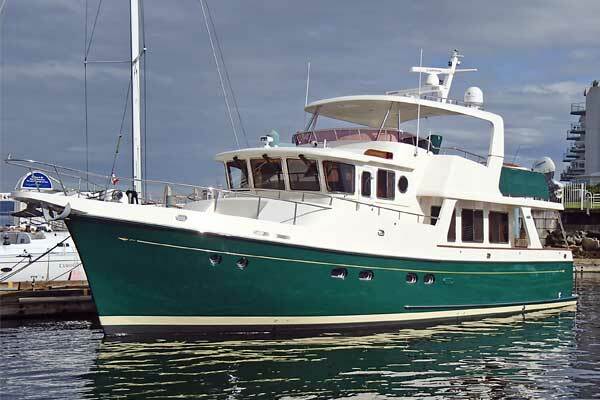 A good certified yacht broker will set aside some time to visit a ship yard with you to show you trawlers hauled out of the water. You can learn a great deal about hull shape, thrusters, through hulls, active fins, rudders, propellers and shafts. You will also be able to better appreciate what will happen when you run aground (a reality of cruising – most times a soft landing, not a big crunch) and should be aware of the design choices you have.